That Leonardo practised as a sculptor is not in doubt, but attempts to attribute surviving sculpture to him have met with generally unsatisfactory results. 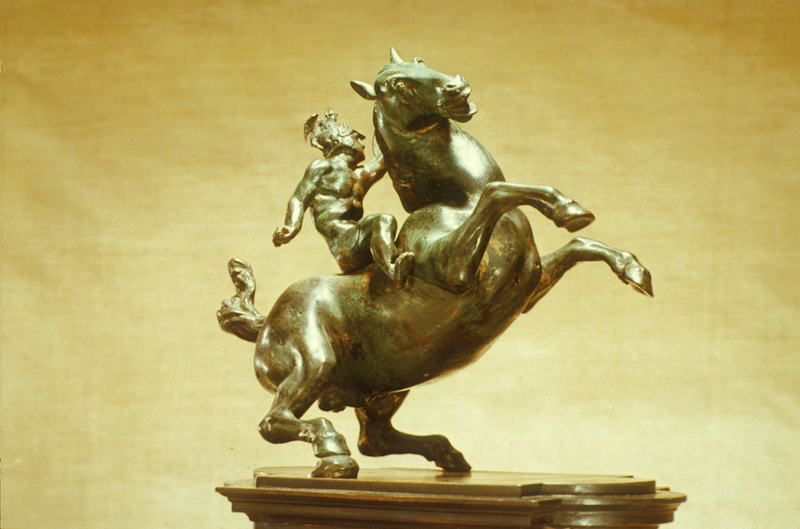 Among the bronzes that bear some resemblance to Leonardo’s designs, the best contenders are a series of small-scale rearing horses with riders. Two versions (Budapest, N. Mus. ; Louisville, KY, Speed A. Mus. ), the latter probably representing Marcus Curtius, can be related to drawings of rearing horses of the Battle of Anghiari type, such as the sheet of studies of Horses, a Cat and St George and the Dragon (Windsor Castle, Royal Lib., 12331). However, the generalized anatomy of the Budapest horse suggests that it is at best a later variant of a Leonardo design, while the Marcus Curtius has an awkwardness in proportion and balance that points to a follower, possibly Rustici. 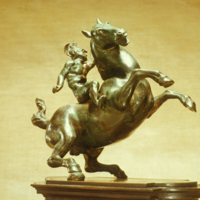 attributed to Leonardo da Vinci (Italian sculptor, 1452-1519), “Small Equestrian Statue,” Institute Images Online, accessed April 24, 2019, http://westerncivart.com/items/show/2935.